Our friend and renowned aviation photographer Frank Crebas just flew with the Florida Air National Guard during their detachment to Graf Ignatievo, Bulgaria as part of Operation Atlantic Resolve. The Eagles were not alone during the flight; MiG-21s and MiG-29s of the Bulgarian Air Force joined up for some photo magic. American F-15s have been forward deployed to Eastern Europe for over three months now, with no end to their mission in sight. Considering how small America’s F-15C/D Eagle force has become, with five wings flying the jet here in the US and two overseas, it will be interesting to see what effect the stress of constant deployments has on the relatively small and Air National Guard-dominated F-15C/D Eagle community. In the meantime, Eagle pilots are undoubtedly enjoying mixing it up with highly dissimilar aircraft, including the MiG-29 Fulcrum. Threat simulation training using F-16 aggressors to mimic a MiG-29 is quality training, but the real thing is even better. 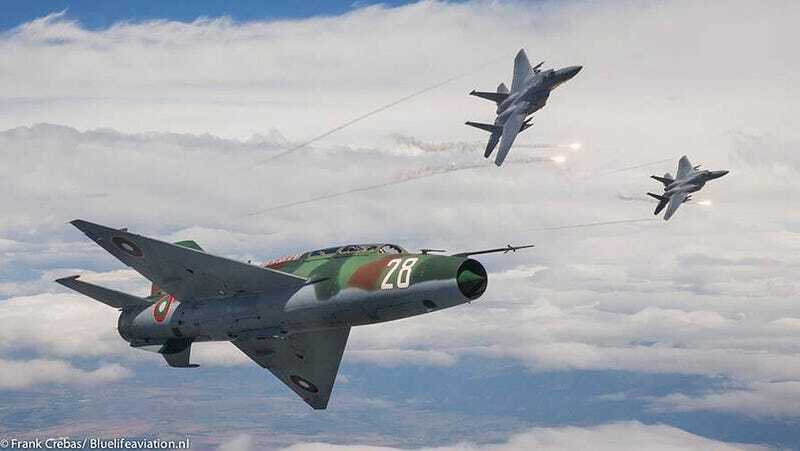 When it comes to dissimilar air combat training, the diminutive and relatively ancient MiG-21 facing off against an F-15 is about as dissimilar as it gets in the fighter world. With proper tactics and some simple upgrades, the MiG-21 Fishbed remains a surprisingly deadly fighter that can catch even the legendary Eagle off guard. USAF F-16s are already present in the region, but in their current form, they can’t compete with the F-15C with its new APG-63V3 AESA radar. Only the F-22 is more potent than the Eagle in U.S.A.F. service, and after comments made by the Secretary of the Air Force at the Paris Air Show, it is clear that we could see the Raptor migrate to the region in the future if tensions don’t de-ecalate between NATO and Russia. A big thanks to Frank Crebas for letting us post these awesome shots. Make sure to check out his awesome website here and like his Facebook page here.